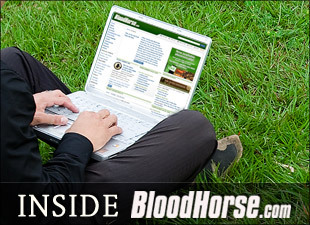 Over the next few weeks, we will be rolling out a new BloodHorse.com homepage in several phases. Our intention is to test each new segment of the homepage until we get it right. When all is said and done, the BloodHorse.com homepage should be noticeably (but not substantially) different from what you are used to seeing. Some changes will be obvious, others more subtle, but hopefully they will all be for the better. We invite you to use this blog space to critique the new design, offer up any suggestions that you may have, or to simply ask a question. The BloodHorse.com community will be involved throughout this process, and your commentary is invaluable to us. Today's Headlines - We know that a lot of our readers only want to see the news when they come to BloodHorse.com. Time is at a premium these days, and we understand that some of you may want to stop by just to see the latest news. Taking that into consideration, we've created a new channel entitled "Today's Headlines" that will always be pinned at the very top of the homepage. Every story that gets posted on BloodHorse.com, no matter what the topic, will appear in this channel. We've also added two new boxes that will display some of the latest features that have been posted on the site. A feature could be anything - blog, video, poll, special report - that has recently been posted to the site but doesn't qualify as a news item. For example, if you're searching for the latest episode of And They're Off, this would be the place to find it. Channel Order - Whenever we do a survey of BloodHorse.com readers, we often hear people say they don't like the fact our channel order is constantly changing. One day Racing may be featured at the top of the page, another day it may be Breeding, and so on. We certainly understand why this would be confusing to our readers. With the new homepage, the channel order will not change. Today's Headlines will always be at the top, followed by Racing, then Breeding, and so on. We may move some of the channels around during the redesign process based on your feedback, but once a final order is established, it will be in place for the long haul. We hope this change leads to a more consistent, and enjoyable, browsing experience for our readers. Phase II is highlighted by redesigned Racing, Breeding, and Sales sections. Some of you may be seeing Phase II right now, while others will need to wait a few weeks (we randomly split our visitors into two groups). In this second phase, we've made it easier to access race results, entries, sire lists, and sale results. In addition, we've added an embedded video player on the homepage that provides quick and easy access to our race replays. We welcome all feedback and look forward to hearing your thoughts.